Nexus have been handed an extra £23m from the Government to help upgrade the train network. The funding, awarded by the Department for Transport, means Nexus now has a total of £93m to renew the Metro system over the next three years. The extra money will allow Nexus to create around 60 new jobs as well as sustaining hundreds more among engineering and transport contractors. Local Transport Minister Norman Baker travelled to North Shields on Friday to announce the cash boost. He said: “This is a major programme of renewal of the Metro infrastructure and will bring real benefits to the people and economy of the North East. “The money gives Nexus the certainty to plan ahead and deliver the best outcome for Metro users. I’m very pleased to see the improvements that have already been made here. This money is going to make the network more attractive and encourage people to use the system more. Ken Mackay, director of rail and infrastructure at Nexus, added: “We are delighted the Government has shown its commitment to Metro modernisation by confirming this funding, which will allow us to deliver vital projects along the network. Among the projects set to be carried out between 2013 and 2016 are track renewals from Tynemouth to Gateshead, train refurbishments, the upgrade of stations, improvements to communications and signal systems, and replacement of overhead power lines. The modernisation programme is the largest renewal scheme on the network since it was opened in 1980. It has already seen Nexus replace 18km of track, revamp 10 stations and 20 trains, replace lifts and escalators, and introduce 225 new smart ticket machines. The North Shields Metro station reopened last year after it was completely rebuilt. Maggie Richardson, president of the North Shields’ Chamber of Trade, said: “The Metro system is a gateway into North Tyneside and this funding will help to improve it further. “The new North Shields station is fantastic. Before the refurbishment, it was dark, dreary and frightening. Now it is much more open and attractive. North Tyneside Mayor Linda Arkley added: “I’m delighted with this announcement of extra funding. The Metro is a vital route for people coming into the borough and it’s important that the infrastructure is in good shape. 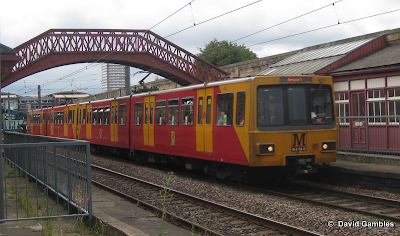 Metro is Britain’s busiest light rail network outside London. It is used by 38 million passengers ever year.